This PhD research project concerns developing a better understanding of the working lives of Western Australian Visual Artists. Visual Art practice is a poorly understood vocation for many reasons, including the great diversity of practices now encompassed by the term ‘Art’ and the significant difficulties involved in defining serious artists (‘professionals’) from hobbyists. 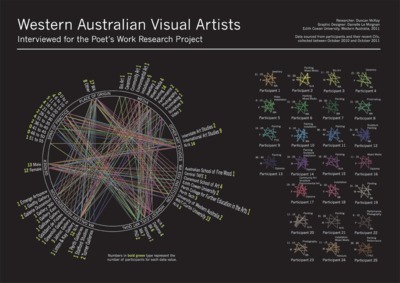 The brief was to produce a graphical multi-dimensional way of representing the research data focussing on the practices, social actors, entities and institutions of Western Australian artists.